"Why didn't I get to play The Hulk in The Avengers...Answer me!" Running Time: 2 hr. 15 min. A rogue secret agent shoving a tracking device down a wolf’s gullet to mislead a missile-armed predator drone is a scene that sounds awesome even on paper. 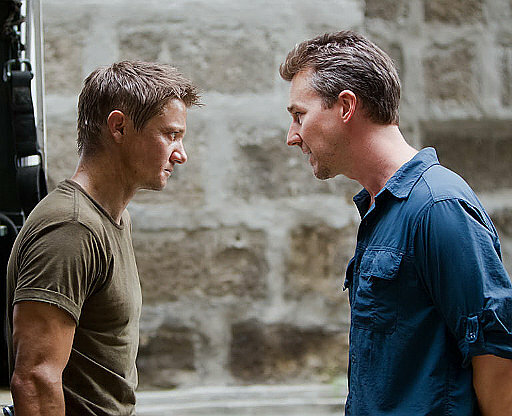 Unfortunately, there’s not enough of those adrenaline rushes in The Bourne Legacy, the fourth installment in the movie spy series. Relentless early cross-cutting reveals that events in this sequel take place concurrent with those in the last Bourne film. With Jason Bourne on the loose and running amok (Matt Damon doesn’t appear, but his photograph does several times, curiously), the CIA decides to terminate other black ops programs, including their chemically-enhanced field agents. When Aaron Cross (Jeremy Renner) escapes a drone attack, he circles the globe looking for Dr. Marta Shearing (Rachel Weisz), a geneticist with access to the chems and viral cultures needed to keep Cross super fit and focused. Whereas the original Bourne trilogy was a modern-day Frankenstein story—a mind-altered monster searching for a creator now trying to destroy his creation—this reprise is about a junkie jonesing for his pills and a vial of liquid detox. Little else really happens aside from Cross and Shearing dodging repeated efforts to, you guessed it, eliminate them. Still, consider me a sucker for jut-jawed bureaucrats—played here by Edward Norton, Stacy Keach, Dennis Boutsikaris, Scott Glenn and others—barking urgently to “cut off all loose ends” and “minimize the damage.” Tony Gilroy (Michael Clayton), who adapted the screenplays for the preceding three Bourne films, assumes the series’ directorial reigns from Paul Greengrass. The consequence is an increased predilection for dialogue and labyrinthine plot lines and less for kinetic action. The film has its breathless moments: a workplace shooting massacre is cruelly captivating, while a climactic car-and-motorcycle chase through the streets of Manila is exciting if haphazardly shot. And while Renner doesn’t possess Damon’s magnetism, he grittily fills his predecessor’s shoes. As a standalone, The Bourne Legacy is an engaging spy thriller. As the inheritor of the Bourne mantle, however, it’s merely an adequate continuum…until and if Damon and Greengrass decide to jump back in.